Out of the countless world-changing innovations brought about in the last hundred years, the most transformative have been new technologies that serve to connect the disparate corners of the earth closer together. The internet springs to mind as the most immediate example, but despite its widespread availability in the 1990’s, it will play a much larger role in shaping our current century than it did the last. For all its advances in the fields of medicine, warfare, technology, and culture, the course of the twentieth century was perhaps most fundamentally shaped by the advent of aviation. We often talk about the “miracle of flight”, expressing astonishment at the idea of lifting a multi-ton metal behemoth into the air and crossing vast distances in a matter of hours– not days. This was a watershed moment in our understanding of the limits of mankind’s abilities, and it emboldened us to parlay this understanding into further innovations– reaching greater and greater heights until we had escaped the terrestrial bounds of the planet altogether. But before all this could happen, we needed a small group of daredevils and dreamers to (quite literally) launch themselves into the unknown. In 1927, pilot Charles Lindbergh instantly became an iconic figure of the twentieth century by daring to make the first-ever solo transatlantic flight, navigating a nonstop route from New York to Paris. He detailed his harrowing, landmark experience in his 1953 autobiography, the film rights of which were inevitably snatched up by Warner Brothers. The task of adapting Lindbergh’s account into a screenplay fell to Wendell Mayes and acclaimed film director Billy Wilder, hot off the success of 1955’s THE SEVEN YEAR ITCH. While shot mostly during that same year, a series of production woes delayed the resulting film from wide release until 1957. That year in particular was something of a monstrous one for the seasoned filmmaker– he had just hit a personal milestone in reaching 50 years of age, and would achieve a professional milestone in releasing three features in a single year. Wilder’s adaptation of Lindbergh’s historic flight, THE SPIRIT OF ST. LOUIS, would be the first out of the gate, and while it climbed to soaring new heights in terms of the director’s artistic development, a poor showing at the box office would bring the whole thing crashing back to Earth. THE SPIRIT OF ST. LOUIS is almost exclusively focused on Lindbergh’s historic flight in 1927, save for a string of narrative detours that flash back to critical developments in his backstory. Wilder’s story fascinations lie singularly with the minutiae of his historic achievement, tracking how he navigated across the Atlantic with only a fold-out map, a pack of sandwiches, and the stars guiding him onwards to Europe. This minimalistic approach– detailing the Herculean effort to overcome a singular challenge– generates a high degree of suspense (especially since we already know the outcome), and sets a narrative template that later streamlined thrillers like Alfonso Cuaron’s GRAVITY (2013) would follow. Venerated screen icon James Stewart bleached his hair for the role of the courageously ambitious Charles “Slim” Lindbergh, a move that illustrates the exterior nature of his performance as required by the narrative. Indeed, most of Stewart’s acting is entirely external– reacting to events outside his cramped tin can of a cabin while his inner monologue unfolds in the form of a near-constant voiceover. Wilder’s story clearly aims to paint Linderberg as the classical everyman hero, so the plucky, can-do nature of Stewart’s physicality seems to suggest a perfect fit. While he’s ultimately effective in the role, one can’t escape the feeling that Stewart might be woefully miscast here– the least of reasons being that he’s a 50 year old man playing someone half his age. As such, Stewart reportedly had a difficult time shooting the film, and his performance ultimately took something of a beating from discerning critics (one of whom was apparently Lindbergh himself). THE SPIRIT OF ST. LOUIS continues the notable growth in cinematographic skills that Wilder established in THE SEVEN YEAR ITCH, delivering his second consecutive Cinemascope presentation in glorious 35mm Technicolor. THE SEVEN YEAR ITCH saw Wilder familiarizing himself with the new territory on either side of the frame, and the compositional lessons he learned there pay off here in spades. Depth is still a compositional priority for Wilder, but THE SPIRIT OF ST. LOUIS allows him to use the Cinemascope format’s advantages to their fullest, capturing gorgeous vistas and sprawling landscapes with a scope that’s nearly epic in proportion. Dual cinematographers Robert Bunks and J. Peverell Marley help Wilder achieve an earthy, industrial vibe, employing evocatively textured, high-contrast lighting setups that stand in stark opposition to the bright and even lighting seen previously in THE SEVEN YEAR ITCH. In its approach to montage and movement, THE SPIRIT OF ST. LOUIS is a drastic departure from the minimalistic in-camera cutting techniques that Wilder had built his career on. He cedes significant territory to his editor Arthur P. Schmidt, who is able to generate a great deal of excitement and suspense with his quick pacing. Whereas Wilder previously relied primarily on his master setups, supplementing them with motivated camera moves or strategically-placed coverage, THE SPIRIT OF ST. LOUIS is comprised of flashy, almost-expressionistic edits. Take the New York takeoff sequence, for instance– one of the film’s big set pieces. As Lindbergh bombs down the runway, unsure if his plane will lift off before he runs out of muddy tarmac, Wilder and Schmidt evoke breathless suspense by intermixing quick cuts, dynamic camera motion, and extreme closeups. Indeed, this 1957 film plays like one made in 1997 or 2007, making substantial use of the day’s cutting-edge special effects techniques to tell its story. The needs of the film’s story necessitate Wilder diving deep into the world of visual trickery for the first time, utilizing a mix of process shots, aerial photography, action stunts, and even archival footage showing Lindbergh’s homecoming parade in New York City. His adoption of modern visual techniques also applies to his treatment of music, as evidenced in the scene where he abruptly cuts out longtime collaborator Franz Waxman’s brassy, heroic score to bring our attention to the fact that Lindbergh’s engine has suddenly stopped working. To reflect the times, Wilder peppers in a few era-appropriate swing tracks, while Waxman references the Parisian endgame of Lindbergh’s quest by layering the French national anthem, “La Marseillaise”, over his original suite of cues. 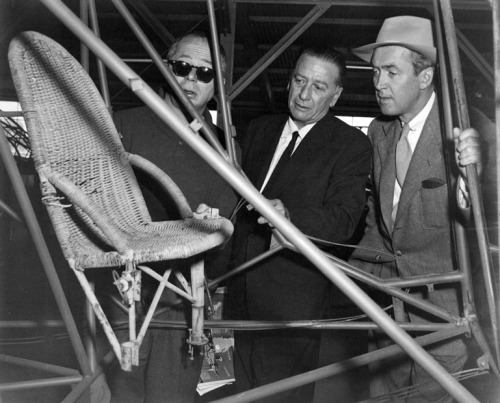 The inclusion of Paris– a recurring city within Wilder’s work– isn’t the only directorial signature to be found in THE SPIRIT OF ST. LOUIS. His infamous barbed wit can be found throughout the film, as well as his tendency to define his characters via their occupations. Just as the story is single-mindedly devoted to Lindbergh’s historic flight, so too does Wilder’s Lindbergh identify himself first and foremost as a pilot– every waking thought is dedicated to flight, the challenges of which serve as the ultimate test of mettle and manhood. Wilder uses the visual shorthand of uniform to communicate this idea, whether it’s in the collective sense (seen in the suited finance bankers or the soldiers of Brooks Field), or on the scale of the individual (like the coveralls and utilitarian flight suits that Lindbergh wears). These conceits factor into the larger thematic exploration that’s definitive of Wilder’s artistic character: class divisions and conflict. Although in real life the famed pilot hailed from a fairly privileged background (his father was a Congressman), Wilder paints Lindbergh as a blue collar, middle-class Everyman. We see him in simple clothes, battling against cigar-chomping financiers and snooty airplane vendors in expensive suits– many of whom are initially reluctant to help his grandiose ambition because he doesn’t fit into their preconceived notion of what a “pilot” should be. As it happens, the ones who are actually able to assist in realizing Lindbergh’s dream aren’t the executives in the high tower, but the craftsmen and the laborers in the trenches. They are willing to roll up their sleeves and get their hands dirty, and in the end are rewarded with a tangible result for their efforts. While it may seem like an effortlessly assembled film, THE SPIRIT OF ST. LOUIS’ making was anything but. The considerable technical demands of the story caused numerous unanticipated troubles, with the resulting delays nearly doubling the number of planned shooting days while inflating production expenses to dizzying highs. To add insult to injury, the film opened to mixed reviews from critics, and flopped with a resounding thud at the box office. Wilder, the perennial Oscar nominee (and sometimes winner) in previous years, would have to console himself with a sole nomination for the film’s visual effects. He had weathered rough air in his career before, and there was little doubt that he wouldn’t pull through again– after all, he still had two more features in the pipeline for 1957 alone. Nevertheless, it still must’ve stung to have been brought so low after the high career watermark he enjoyed with THE SEVEN YEAR ITCH’s success. Today, THE SPIRIT OF ST. LOUIS is barely remembered within Wilder’s filmography– a forgotten minor work, at best. However, I’d argue that the film is ripe for a reappraisal, if only for the fact that it’s the rare maximalist spectacle film amongst a body of work known for its muscular minimalism and non-genre aesthetic. 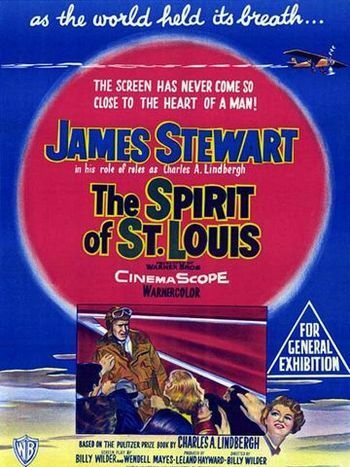 THE SPIRIT OF ST. LOUIS certainly hasn’t aged as well as Wilder’s better-known work, but it does retain a strong degree of modernity in its presentation, which anticipates the four-quadrant populist styles of filmmakers like Steven Spielberg or JJ Abrams. The film forced Wilder to address his skillset in the special effects arena, and in the process made him a more well-rounded director than ever before. All told,THE SPIRIT OF ST. LOUIS isn’t just effective entertainment– it’s a riveting account of one of the twentieth century’s most important achievements, executed with style and integrity by a celebrated director working at the top of his game. THE SPIRIT OF ST. LOUIS is currently available in high definition via iTunes and on standard definition DVD by Warner Brothers.